The new 36,000 Sq. 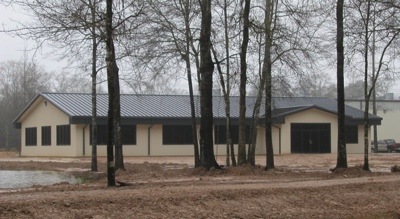 Ft. facility was designed for Triad’s specialized manufacturing requirements. Overhead cranes and specialized equipment allow for the efficient flow of material through the facility. In support of our customer’s quality monitoring systems we offer private offices for supplier quality engineers. These offices are equipped with private phone, fax and internet connection lines. Click for full sizeIn support of our customer’s quality monitoring systems we offer private offices for supplier quality engineers. These offices are equipped with private phone, fax and internet connection lines. Triad has a supply agreement with an ISO certified CNC machine shop. This shop has several CNC lathes and other equipment that can be viewed on the Machining page of the website. Office Space - 6,000 Sq. Ft. Storage Space - 3,000 Sq. Ft. Enclosed.